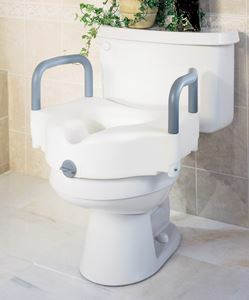 Locking Toilet Seat with padded arms by Medline Canada is designed for those who needs extra support when on the toilet seat. Features locking mechanism that is easy to use. Installation is easy without the need of tools. Comes with padded arm rests to ensure safety of the users. Seat raises upto 5" over the toilet seat.